As this is being republished later in the year in the SF Masterworks series, I thought that I’d review it just now. Make myself seem up to the minute, y’know? Although… “up to the minute” might be stretching it, given the books original publication in 1975. The Female Man is explicitly a feminist science fiction novel. It uses the device of four (loosely speaking, they differ in time) parallel worlds to explore gender roles by challenging each of the main characters from each of these pre-conceptions of femininity. The four worlds are: Joanna’s world, which would have been roughly contemporary with the readers in 1970; Jeannine’s world where the Great Depression had never ended; Janet’s world (or Whileaway), a futuristic utopia, where all men were killed in a plague, which, despite having access to high-technology (not least the ability to reproduce by merging ovum), is largely agrarian. The environmental concerns expressed here reminded me a little of some of the backdrops to Ursula LeGuin’s work (and, of course, LeGuin often foregrounds sociological themes herself). Finally, theres is Jael’s world, where a civil war between men and women, literally a battle of the sexes, has been raging for 40 years. Writing this out, I realise that all of this could sound didactic, cold or humourless. I don’t think it is, although I have plenty of sympathy with the author. If you’re the type who, on hearing the word “feminist” immediately shouts “man-haters” (if you’re clever, “misandry”), or makes a witticism about dungarees, then you aren’t likely to enjoy this. However, even if you don’t agree with her politics, but are willing to examine your own beliefs, Russ has written and interesting and, importantly, stylish novel. “MC: When the-ah-the plague you spoke of killed the men on Wileaway, weren’t they missed? Weren’t families broken up? Didn’t the whole pattern of life change? How do the women of Whileaway do their hair? You couldn’t imagine such a vacuous question being asked of a woman from a parallel future nowadays, could you? Joanna’s world, most clearly a representation of ours, sees Joanna attempting to free herself from the constraints of being a woman at this time. She wants to be taken seriously a person and not forced to conform to what other people think she should be, not to submit to male dominance. This is where the title The Female Man comes from. She wants to redefine herself so that she is respected on her own terms. Jael, in the novel, is less driven by emotion than the other three main characters, as she comes from a world with a literal war of the sexes, she has become hardened and it is her who engineered the four women meeting. Beyond the wide understanding of the history of SF that I think this novel has, it has many other literary allusions, an obvious one being John Stewart Mill, further (and I confess that I had to look this one up, not being overly familiar with the Bible), the name “Jael” itself, is a reference to Yael in the bible, also a female assassin. The other thing to note about The Female Man is that, while it is blazing with righteous anger, it does actually have (an admittedly prickly) sense of humour. I sometimes wonder if, when describing such things as being “humourless,” what they mean is that it’s not a humour that they share, or one that offends or challenges them too much. The obvious question to ask when you finish reading one of this books is: “is it a masterwork?” In the case of The Female Man I think, yes, it is. It features challenging (if arguably out-dated, though not to say worthless, naturally 21st century feminism is grounded in this stuff) ideas and, in the context of its time, would certainly have turned heads. Also, it has plenty of SFnal ideas. The multiverse and the question of how time-travel paradoxes (which would be necessary to get Janet Evason to visit the US in the late 1960s/early 1970s) is explored early on, for example. The answer being given that there would be no paradox as if you were to go backwards in time, the future you would return to wouldn’t be your own. It would be one which already featured any alterations you made, while your original time-stream would still exist. The four parallel worlds also necessitate a non-conventional narrative style. The points of view in the novel jump around which do ask a little from the reader. This helps to keep the work fresher than a simpler structure perhaps would. It also, in places, utilises a stream of consciousness style of narrative – this perhaps won’t appeal to all but, again, I think it does help sustain interest in the novel. 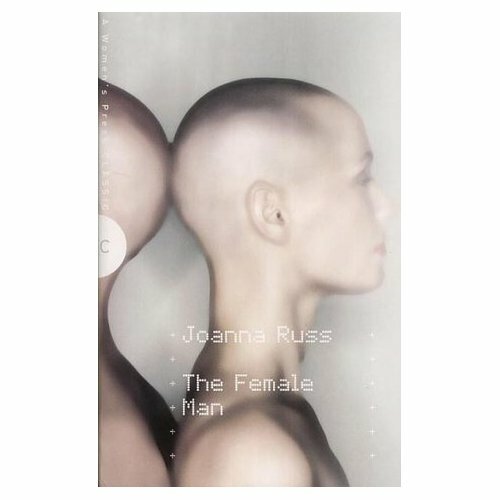 This entry was posted in Review and tagged feminism, joanna russ, novel, sf, usa. Bookmark the permalink. Are you kidding? The talk-show circuit would be all over them like a rash, desperate to other them as bull dykes and reassert “traditional” femininity in the face of this alarming outside influence. If they were lucky, they’d be a freak show; if they were unlucky, they’d be considered a threat right away and put under military supervision “for their own protection”. We’re in a better place than the seventies with respect to equality among genders, but don’t kid yourself that we’re as egalitarian as we like to imagine ourselves to be. But, hell yes, in my own cack-handed way that was the point I was attempting to make. You’re right – whilst there are some barriers that have been removed, reading this novel is actually a pretty depressing experience when you consider how little some things have changed. When I see/read some things the phrase “complicit in your own oppression” springs to mind. For that very reason, I really hope that this novel finds a new readership come republication in November. Yeah, that jumped out at me too. I immediately thought about how America’s first lady Michelle Obama, despite having a degree from Harvard Law School, is always asked about: hairstyles, clothes, and children. The sarcasm didn’t jump out at me there. But yes, good review! Glad you liked the book. Indeed! It’s an excellent novel, has a lot to recommend it. I’m glad it’s getting republished – I have to confess that I only became aware of it from, of all places, a pull-out in the Guardian a couple of years ago (IIRC Michael Moorcock recommended it). I think it still has a lot to say, and not only that, it’s an interesting read, with some nice Joycean stream of consciousness going on (OK, I’ve just finished read A Portrait of the Artists as a Young Man). Haha…I thought about making that paragraph a bit longer to include an example (much like your Michelle Obama one – that’d be perfect to illustrate the point, actually, on several levels). But I think it’s probably best if I let the comments here deal with my failure! Yeah I was wondering last night why Ty wasnt the first point off the bench. If you have J.R. Smith, Birdman, and Lawson coming in the game to change the pace, it would be something to see. A fast pace, high energy squad wh2;o8#17&s game would complement each other would definitely change the game. Karl must really not trust Ty or like old guards who look bad against everyone in the league. Hold on, that thought process sounds kinda familiar.